For the love of life: My Favorite Things! Hi there...how is your weekend so far??? Well, I have a CUTE card to share with you and some excitement that I haven't shared here on my blog yet, so I am doing that today. This has been a fun week, that is for sure! :) Have been very busy with developing my business, but also fun creativity wise. A while back, My Favorite Things sponsored our Caardvarks team, so I received a few of their stamps as part of design team member, and I have to say I really enjoyed playing with them. 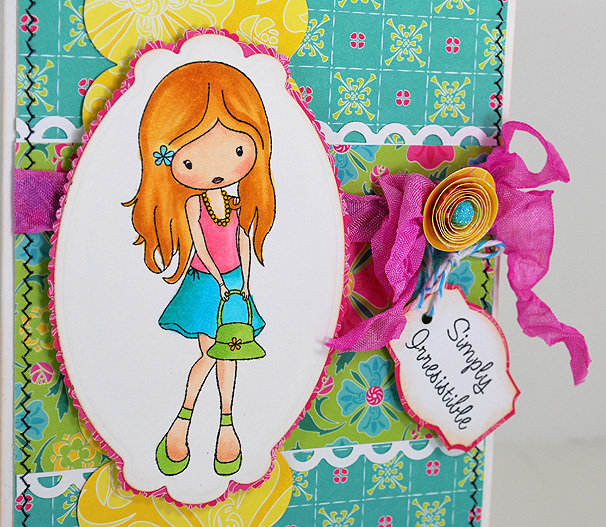 Than moving forward a few months, my fellow Ippity DT mate Lisa Henke made it on their design team and I saw her sweet cards on her blog ALL THE TIME!!! Just enticing me!!! Hehehe And one day I commented on her blog post, not even realizing there is a blog candy possibility involved...so can you believe I won the blog candy???? Well, going back to the Caardvarks goodies we all received. Some of the girls got this little stamp (Jolinne All Dressed Up), that I swore to myself that I HAD TO HAVE her some day...do you ever have a stamp that just grabs you???? Well, this little Jolinne did just that, so when I won the GC, I knew I wanted to pick her up and thankfully she was in stock, too. So, I got her along with a few dies and more little stamps, that I loved. So, I have been making a few cards here and there, when time allowed and I decided why not try out for their guest design spot? There was a color combo challenge involved...and they happen to speak to me and were totally the Cosmo Cricket Delovely colors, so here is the little card I made with the famous Jolinne stamp I so wanted! And here is a little close up of her and the My Favorite Things rose die, that I am so in love with. In fact if you didn't see my cupcake birthday card I made for Karen on Thursday, check it out, as I used these pretty flowers on that, too. So Wednesday was the announcement of who the November Guest designer would be during their new release party on Splitcoaststampers. I waited patiently, chatted with the other participants, got to know people a little in the MFT Forum and than came the coded post with the winner's name and Jody used a "special invisible ink" hehehe to type the winner's name and since I was new on the scene, I couldn't tell who won..LOL..so to my surprise, it was ME... So, hooray!!! I am going to be guest designing for My Favorite Things in November and I am totally tickled pink excited about it! I can't wait to receive the new goodies and I already put in a sweet little order, since I needed to get their new Polka Dot Greetings die and stamp set, the new Rolled Rose die (that will be my new favorite, wait till you see it, if you haven't yet!!). I also got their new Snowflakes, and the grass diecut...ohhh...so fun!!! And I picked up a sweet Pure Innocence stamp called Blooming Good day! So I will have plenty more to play with!!! And I have to APOLOGIZE UPFRONT for all the enabling that might be happening here very soon...LOL...sorry....I can't help I LOVE PRETTY stamps! OK, that is it for today. Tomorrow, I will be back with another fun card....do you like banners???? Well, if you do, come back tomorrow! That is all I am going to say...hehehe.